Kate Armstrong, Alan Bigelow, Louisa Bufardeci, Laura Beloff, J.R Carpenter, Jonah Brucker Cohen, Vuk Cosic, Fallen Fruit, Luka Frelih, Buckminster Fuller, Rolf Van Gelder, Natalie Jeremijenko, Carmin Karasic, Paula Levine, Mez, Lize Mogel, Jason Nelson, Christian Nold, Esther Polak, Proboscis, Kate Pullinger, Carlo Ratti, Douglas Repetto, Teri Rueb, Stanza, Jen Southern, Kai Syng Tan, Jeffrey Valance, Sarah Willams, Jeremy Wood, Tim Wright. We are in an age of cartographic awareness that is arguably unprecedented, but is of a malleable map, of layered spaces, of maps in new contexts. 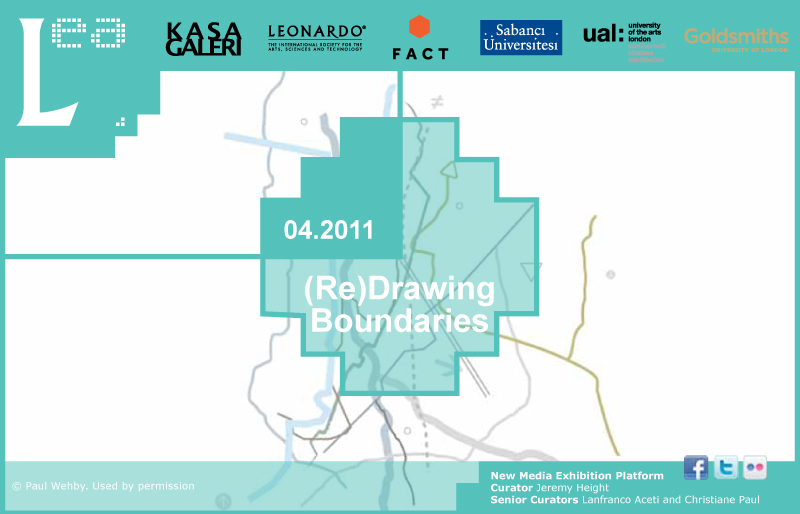 Boundaries are not the only things that are being reconsidered on maps: mapping systems and our base sense of space. It is how we see and share information, communicate, react and remember. The sea change is occurring right now and it is being led by the ideas of works of these radical thinkers and others who are making the static map and our sense of space open up. The range of works in this exhibit have not only shown in Biennials in some cases or started whole fields of work in others, but more importantly, show in them a connectivity of exploration and practice between many people and works in differently named fields. Data is not just cold measure; place is not static; function can be many fold and startlingly so by intention. Space and location are not simply to be marked or named. There are histories, tensions, conflicts, stories, many types of data and ways of measure. This show will exhibit 2 new important artists/practitioners each week from several different fields. We begin with locative pioneer, Teri Rueb, and cross platform provocateur, Jonah Brucker Cohen. Both look at space, data and why we should be more aware and inquisitive but in very different styles and aesthetics.